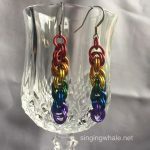 Come back soon to see the new section about chainmaille jewelry offerings. Under construction now! If you saw a piece at a show or on line and want one, contact me directly or visit my Etsy shop (some pieces are already listed, more coming!) and we will make it happen. Thanks! If you see something on the site which you would like to buy but that is not posted on my Etsy shop, please feel free to contact me directly. I will be happy to make pieces 'on demand'! Using images of glass pieces that I have cut for pins, I am making shattered glass ceiling postcards. Find out more! Site by Amy J. Putnam. All photos ©Amy J. Putnam.